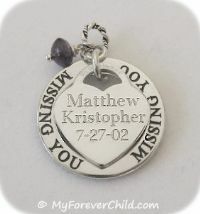 Our Missing You Personalized Charm makes a thoughtful and lovely memorial gift. A .925 Sterling Silver Medium Heart Charm rotates freely inside a sterling silver affirmaion disk engraved on both sides with "Missing You". Sterling Silver heart charm measures 17mm wide x 19mm high. Enter personalization engraving fields below. Designer's Note: the more personalization that is placed on the front side of the heart charm, the smaller the font size needs to be to fit properly. For the largest possible font size, we recommend that only 1 name be placed on each line, and that dates or a special message be placed on the back of the heart. Also, the Roman Font will render the boldest text for easier reading. Please read the terms of engraving before ordering this product. You can select a gemstone dangle and chain below. "I just received my order which included the "Missing You" charm with birthstone. I ordered this for my son Jacob, who was killed in an auto accident in February 2009 at the age of 12. I just wanted to write to you to thank you so much for this beautiful piece of jewelry and for all that you are doing on your site to support bereaved parents. I have recommended your site to several friends and hope you continue to find success. I just came across the site via Google and am so glad I did. The charms are beautiful. Thank you so much again! ~Anne"